Yesterday we threw together some 'medieval' looking garb, packed the kids into the car, and headed off to Rowany Festival for a day trip. 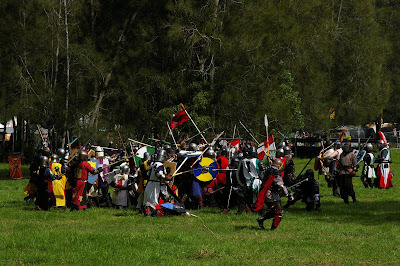 The Festival is an annual five day event held over the Easter long weekend, and many SCA (Society for Creative Anachronism) members travel from all around Australia to camp at the event. I've never been keen enough to camp at Rowany Festival, and we hsdn't visited the Festival for several years after it had been relocated to a site near Canberra, about three hours drive South of Sydney. However, last year the Festival had been moved closer to Sydney again - to a new site at Glenworth Valley, which is only about 45 minutes drive from where we live, so this year we decided to go for a visit. After a leisurely picnic lunch we attended a class on easy medieval dances, and in another class the kids learned how to make a period windmill toys, which they enjoyed. Unfortunately, although the weather was fine it was extremely humid and warm, so we left early in the afternoon rather than stay to watch the afternoon battles and attend the royal court. The cost for one day family entry to the Rowany Festival was $73, which was quite expensive relative to the amount of time we ended up staying on site. But the kids had a fun time so I'll be sending in our $50 SCA family membership renewal on 1 May. Hopefully there will be some weekend tournaments and classes held during the year which we can attend. I may even attend some of the weekly fighter training sessions this year, now that they are being held on Monday nights rather than on the weekend. But first I'd have to finish making/buying the pieces of armour I'm still missing. Over the years I've accumulated a great helm, elbow and knee white armour and a gambeson, but I still need to get some body armour - either by finishing off the coat of plates I started many years ago, or else start 'kniting' a mail hauberk. I've included a photo credit back to you (to this post in fact).